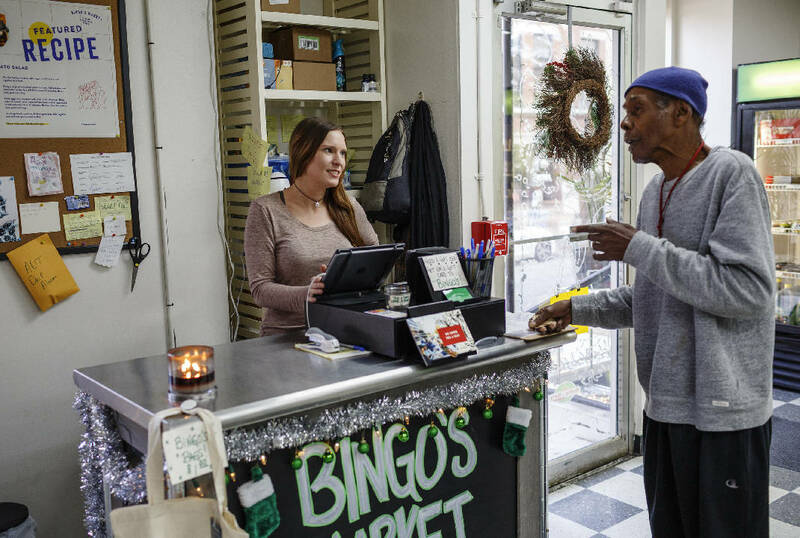 Manager Tara Williams, left, talk with regular and Patten Towers resident Willie "Fish" Whaley in the new Bingo's Market, located on the building's first floor, on Thursday, Nov. 16, 2017, in Chattanooga, Tenn. Accessible from Georgia Avenue, the shop carries fresh produce, packaged goods and ready-made meals. For the first time in years, a business has opened inside Patten Towers, a convenience store called Bingo's Market. Bingo's Market isn't your ordinary downtown convenience store. It's got no cigarettes, beer or scratch-off lottery tickets for sale. There's no soda pop or slushies. Granola bars are the closest thing Bingo's Market has to candy bars. Bingo's Market is a charitable effort meant to bring reasonably priced grocery staples, such as fresh and frozen vegetables, bacon, bologna, milk, eggs and bread, to the roughly 200 residents of Patten Towers, all of whom are either low income or have a mental or physical disability. Bingo’s Market is located on the Georgia Avenue side of Patten Towers, which is at 1 E. 11th Street. Store hours are Monday-Thursday from 7:30 a.m. to 5:30 p.m. and Friday from 7:30 a.m. to 1:30 p.m.
"It's grant-funded for six months," said the store's manager Tara Williams, who runs the market on weekdays store along with another part-time employee, Thomas Chancey. After that, the store has to make a profit, she said. Bingo's Market has support from The Enterprise Center, which is housed in the Edney Innovation Center, along with the Lyndhurst Foundation, the Chattanooga YMCA, the local nonprofit group Causeway, and PK Management, the California-based company that owns and manages Patten Towers. PK Management has given Bingo's Market the first-floor space at no charge, Williams said, and is covering the cost of utilities, too. The company came under heavy criticism from local and state officials for the way it handled an electrical fire in the summer of 2013 that temporarily left the building's residents homeless. Bingo's Market also is meant to bridge the gap, sometimes called the "digital divide" between Patten Towers' residents, many of whom live on less than $500 a month and don't have cars, and the tech-savvy entrepreneurs in the Edney Innovation Center, an office tower across East 11th Street from Patten Towers. So the store carries items meant to appeal to those in the Edney, such as $1 a cup locally-roasted Mad Priest coffee and vegan tahini bowl entrees at $7.50, each, made locally by Vibrant Meals. "Our members go in there all the time," said Mary Stargel, the community manager at Society of Work, a co-working space that takes up two floors of the Edney Innovation Center. Bingo's Market has had almost 1,200 sales since it opened Oct. 9, and turned a profit of about $1,300 on the items it sold over their cost — not factoring in other costs, such as employee pay. Williams, a Knoxville native who moved here six years ago, previously brought food to Patten Towers as a driver for Mobile Market Chattanooga, a charitable service that brings food and produce to "food deserts" around the city. Bingo's Market is still getting its legs under it. For example, the store is looking for wholesale suppliers, since now the merchandise is all purchased from retail stores. Williams also would like more storage space and shelving in the store. "It's been a challenge," Williams said, adding, "I love it. I absolutely love it."